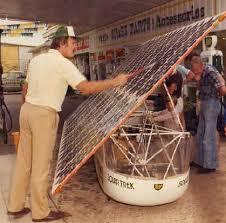 The first solar car to cross a continent. The solar car took only 8 months to build. 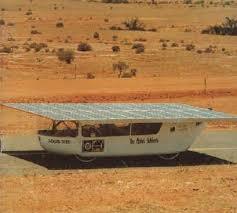 In Australia in 1982, Perkins and Tholstrup, wanting to popularize solar, built the first solar-manned car to cross a continent. With an attitude of, “There’s nothing that can’t be done,” they built the solar vehicle for about $50,000. The car, known as the Quiet Achiever, was designed in only 8 months. It was piloted by Perkins and Tholstrup who only stopped along the route at night to camp. 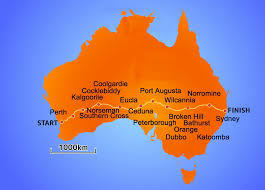 In less than 20 days, the solar powered car made its trek from Perth to Sydney, traveling 2,500 miles from coast to coast across Australia. The solar car traveled 2500 miles in 20 days. The body of the solar car was made of fiberglass and the frame of steel tubing. It had a 1 kilowatt photovoltaic power system mounted on the roof that allowed it to travel approximately 14 miles per hour. Using only the sun for power, the two 12 volt batteries stored enough power to give the car about 90 minutes of energy without the sun. But on this trip there was enough sun to keep the car fully charged at all times. The solar car met with very few problems and was periodically monitored to assure that only solar power was being used. Categories: Building Green, Renewable Resources, Solar, Sustainable Education | Tags: #PerthandTholstrup, #renewableenergy, #solarcar, #thequietachiever | Permalink.